NEW UK Price = �+ Postage - Available direct from the publishers. In UK cheque to Sovereign Publications above. UK=�60 Pay by cheque to Sovereign Publications above. PLEASE ENSURE THAT YOU SELECT THE RIGHT POSTAGE RATE AND THE �COST OF THE BOOK. ERRORS CAUSE DELAYS. Philip Johnson in "Darwin on Trial"
"..a debunking account of the human evolution story...Bowden persuaded me that there are grounds to be suspicious of Java Man and Pekin Man...I would like to see the details he reports examined critically but fairly by unbiased scholars, but this is a pipedream." [p175]. "The author exposes with pitiless logic and documentation the "last word" theories of scientists, geologists and anthropologists..exposing many of them frauds and hoaxes..This is a book of absorbing interest especially to Christian teachers of Science and R.E..Mr. Bowden's exposures are quite unanswerable". "This is one of the most important works for years on the ape-man fossils...the ape-men have not been "discovered" by a huge army of scientists, but rather by a tiny group, numbered in almost single figures, travelling from hoax to hoax. Lastly, many will conclude form this book that right in the centre of this group was non other than Teilhard de Chardin. This book is written by a clear thinker with a scientific approach who has long studied the original books and papers, weighed one account against another, and has now given us the result in a condensed yet clear way. Everyone should have this book and make sure that their public library also has it." 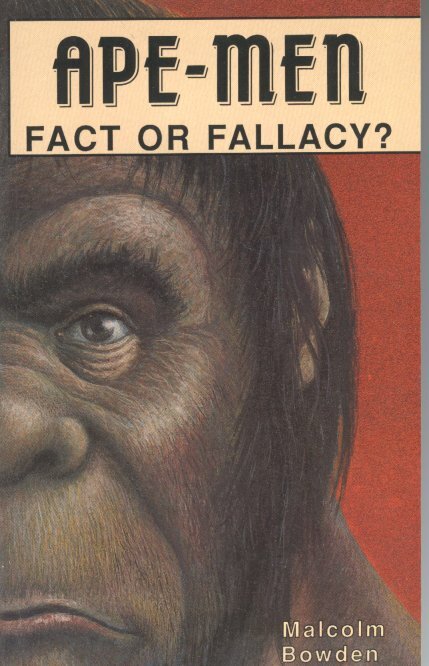 "Although written in a scholarly and technical manner, "Ape-men: Fact or Fallacy?" is, nevertheless, quite easily understood by the non-technical reader and I recommend it to all those who, like myself, have to provide answers to evolutionary questions." "This is an important book...We commend it to our readers. "Anyone interested in the fossil evidence for the ancestry of man should have a copy of Malcolm Bowden's book."